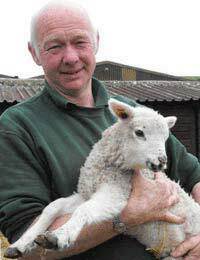 With 47 years experience of working on sheep farms, Terry Wigmore certainly knows a thing or two about sheep!The grandson of a traditional shepherd, Terry’s professional shepherding career began when he left school aged 15. Terry did four years of general farm training but had spent much of his youth helping at a local farm during the busiest periods of lambing and shearing and knew that he wanted to follow in his grandfather’s footsteps. Terry did more than cope; he later became Head Shepherd of 1200 sheep with a lambing success rate of 193% (in 28 days!) and set up a flock of 1000 at Blenheim Palace. His success prompted entry to ‘Shepherd of the Year’ competition in which he drew first.Working on a sheep farm is an all-year-round position that includes all weathers and all jobs. 06:30 am Lambs that have been born overnight are brought in to pens with their mothers. Interestingly, lambs are usually born before midnight or after 05:00 as the ewes give birth on a rising tide. 07:30 am First bottle feeds are given to lambs not fed by their mothers-this is repeated at four- hourly intervals. 08:30 am First concentrate feed is given where appropriate. Newborn lambs are penned with their mothers so that each family group has its own space in which to bond. Terry then moves them to ‘mothering pens’ with other similar groups to encourage the lamb/ewe recognition in a crowd; this is vital for the lambs’ survival. These groups are kept in mothering pens for about a week before being moved into nearby fields. 19:30 Terry goes home for his own feed! He then carries out the necessary administration tasks. During lambing time, Terry finishes between 23:00 and 01:00 depending on the situation. During August the lambs are weaned from their mothers. Sheep Shearing -one of the two busiest times of year on sheep farms. Autumn Sales-selected animals are bought and sold at market. September/October-Flushing takes place. Ewes are moved to rich pasture about two weeks before being mated as the quality of grazing influences fertility. During flushing ewes gain weight and are therefore more likely to maintain top condition throughout gestation. The ewes’ five-month pregnancy leads back into March and the whole cycle starts again. Apparently, sheep can recognise up to 50 human faces and remember them for as long as two years. Terry should know; with 55 different types of sheep thriving there, his sheep centre has the largest collection of sheep breeds in the world and is a big hit with the public.